We went to Margate to hear Mr Corbyn speak last Saturday. It was pretty much as I expected. Not a disappointment and he was a bit more forceful than he comes across on the tv – which is good, more passion and yet still a refreshing non-adversarial stance. Inclusive and unifying. Packed hall – more than 350 (could have been many more, I think I heard that figure but don’t quote me) – a bit emotional at times thinking just maybe there was a chance to turn things around, to climb up out of this depressing world we seem to inhabit at the moment. One of the speakers, I apologise as I forget who, said something like ‘There is all this talk of voting with the head – or the heart – well we are actually talking about the soul of the Labour party’. I liked that. 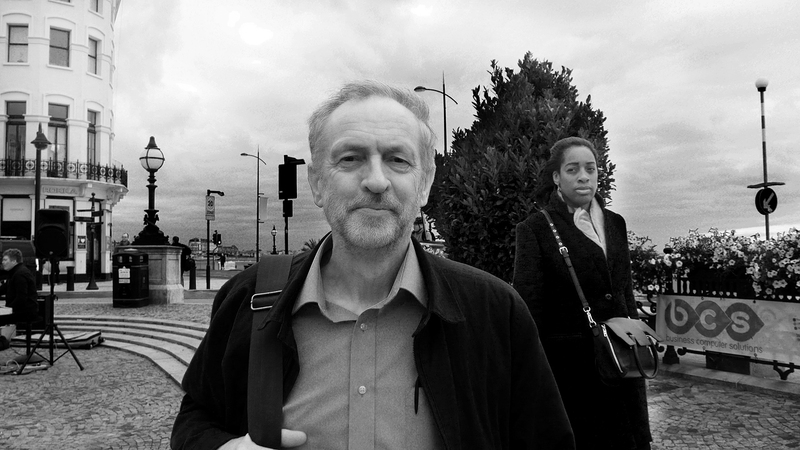 I am tired of all the talk of Corbyn being naive, not having the experience or the gravitas. He speaks with a great positivity and optimism – we should get behind him and at least give it a try. I think membership of the Labour party is characterised by a caring attitude to all others on this planet, it is about collectivism and fairness, it’s about the bigger picture. If those beliefs do not get us elected then we must try harder – not compromise our beliefs to get power at any cost. It had been hot and stuffy in the room so we wandered down to the seafront and had a cup of tea. Marainne went to a dress shop and I went to check out the local band (Project F) playing on the front. I was standing there gently nodding away (coincidentally) to Soul Man ((coincidentally) when suddenly there he was again. Jeremy with just one guy with him, he stopped right in front of me and applauded the band. Too good an opportunity to miss. I tapped him on the shoulder. The other guy wandered on, a few people looked over but mainly he was just another punter watching the band. I shook his hand, had a chat, told him he was doing a great thing, giving us all hope and wished him luck and turned to walk away. Remembered I had a camera in my pocket and said Jeremy can I? Of course he said. Just one shot but a good one. In a strange way he reminded me of Mick Jones of the Clash – not physically but in his attitude. (I have bumped into Mick – a hero of mine – many times and always go and say hello). Jeremy came across as just an ordinary bloke like me, completely natural and un-phased talked more about the band we were listening to than politics. No false bonhomie, no entourage, speeches over, let’s have a wander down the seafront . It was like bumping into any acquaintance on any day – a quick chat, a smile, a handshake then go on with your lives. We are on the same side – doesn’t need saying.